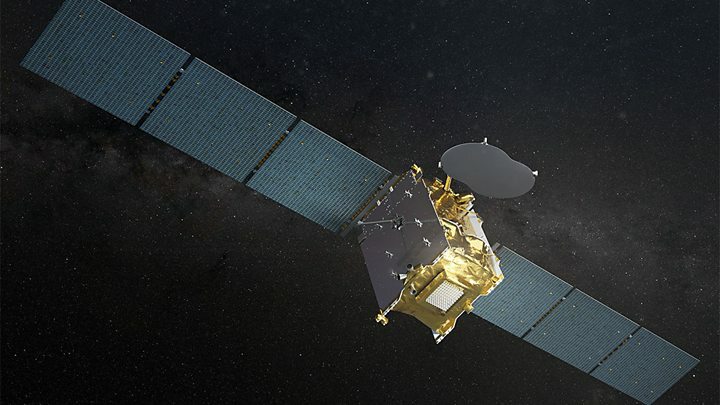 Media captionYohann Leroy: "Quantum writes a new chapter in the satellite telecoms industry"
Quantum's coverage, bandwidth, power and frequency can all be altered in orbit. "It will bring unprecedented flexibility to our customers, allowing for in-orbit payload re-configuration and taking customisation to a new level, while also opening the way to a paradigm shift in the manufacture of telecommunications satellites," he told reporters. "This is the first satellite we'll be sending into geostationary orbit (36,000km above the Earth)," said SSTL Managing Director, Sarah Parker. "It's a completely different requirement and size. It's probably about 10 times the size of the average satellite we build here." This might mean, for example, transmitting only on certain radio frequencies with shaped antennas to carve out the necessary ground "footprint". But telecoms markets don't stand still, and being able to totally reconfigure an in-orbit platform would allow an operator to adapt to any shifts in the business landscape - without the need to build and launch another bespoke platform. The operator would simply reprogram the existing satellite. Those antennas could electronically "change their shape". David Phillips, Airbus's Head of UK Programmes, said the European and UK space agencies had been quite prescient in pushing for the Quantum development. "The components and technologies that enable software-defined satellites will become more and more the future of our industry," he commented. UK technology has made a significant contribution to something like a quarter of all the world's large platforms in this sector. Eutelsat, one of the "Big Three" global satcom operators, counts 23 of its 38 currently operational spacecraft as having British input. Six of their next seven satellites will continue this trend. And to make sure UK industry remains competitive, the home government has pushed considerable investment through the R&D programmes of Esa's telecommunications directorate. Quantum has emerged from a project initiated in 2014 and originally codenamed "AnySAT". "Having assets in space that are flexible and can meet changing needs is absolutely essential, and that has underpinned the UK Space Agency's investment strategy in telecoms over the last few years," she said.